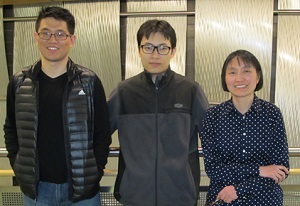 Congratulations to Professor Bing Wang and her students Yanyuan Qin and Chaoqun Yue for winning the prestigious Best Paper Award for their research project entitled “ABR Streaming of VBR-encoded Videos: Characterization, Challenges and Solutions” at CoNEXT 2018, a top computer networking conference. Yanyuan and Chaoqun are co-authors of the paper and Yanyuan is the leading author. This is a joint project with Krishna Pattipati from the Electrical Computer Engineering Department, collaborators Drs. Shuai Hao and Subhabrata Sen from AT&T – Research and Dr. Feng Qian from Indiana University.